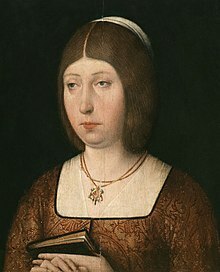 Isabella I (Spaingie: Isabel I, Auld Spainyie: Ysabel I; 22 Aprile 1451 – 26 November 1504), an aa kent as Isabella the Catholic, wis queen o Castile an León (Croun o Castile). She an her husband, Ferdinand II o Aragon, broucht stability tae the kinricks that acame the basis for the unification o Spain. Later the twa laid the foondations for the poleetical unification o Spain unner thair grandson, Holy Roman Emperor Charles V. Efter a struggle tae claim her richt tae the throne, she reorganized the govrenmental seestem, broucht the crime rate tae the lawest it haed been in years, an pulled the kinrick oot o the enormous debt her brither haed left ahind. Her reforms an those she made wi her husband haed an influence that extendit well beyond the borders o thair unitit kinricks. Isabella an Ferdinand are kent for completin the Reconquista, orderin conversion or exile o thair Muslim an Jewish subjects an in supportin an financin Christopher Columbus' 1492 voyage that led tae the openin o the "New Warld". Isabella wis grantit the title Servant o God bi the Catholic Kirk in 1974.